Dr Abdul Hanif Khan at Department of Medicine, Universiti Putra Malaysia Fakulti Perubatan dan Sains Kesihatan, Serdang, Selangor, Malaysia and colleagues have reported a case of Lung malignancy mimicking adult-onset asthma. It has appeared in BMJ case report. Mucoepidermoid carcinoma (MEC) is a rare tumour of the trachea accounting for up to 0.2% of reported primary lung malignancy. 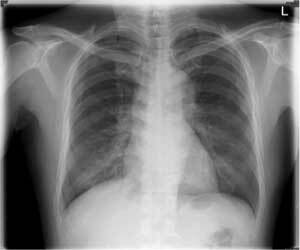 The incidence is reported as 0.1%–0.2% of primary lung cancer and accounted for 1%–5% of tracheobronchial adenoma. In the instant case, the authors report a case of a 54-year-old man, ex-smoker, whose presentation mimicked adult-onset asthma with a cough and wheezing, which did not respond to conventional treatment. He had occasional haemoptysis and weight loss in which CT scan performed for malignancy screening showed a protruding mass in the distal trachea causing endobronchial obstruction. Bronchoscopic intervention was performed to relieve the obstruction that resulted in resolution of asthmatic symptoms. Histological diagnosis confirmed MEC. This case emphasised the importance of a high index of suspicion in an unusual presentation of a common disease and the pivotal role of bronchoscopic intervention in malignant central airway obstruction. The patient was admitted to ward for an elective rigid bronchoscopy. However, while in the ward, he developed worsening upper airway obstruction. Emergency rigid bronchoscopy was performed followed by electrocautery snaring to remove the bulk of a tumour. A residual tumour was removed via rigid forceps followed by application of argon plasma coagulation at the base of the lesion. However, complete excision of a tumour was unattainable. Histological report revealed malignant cells of clear cell, intermediate cell, epidermoid cell and mucous cell type, arranged mainly in solid sheets and lobules with multicystic component. The cells are moderately pleomorphic with low proliferative index. A diagnosis of MEC of intermediate grade by Modified Healey grading was made. Patients with asthmatic symptoms who failed to respond to medications warrant further investigations, for example, CT thorax or bronchoscopy to look for an alternative diagnosis. Mucoepidermoid carcinoma is a rare tumour that may present with obstructive airway symptoms leading to misdiagnosis of asthma. Bronchoscopic intervention has a significant role in the management of malignant airway obstruction.